I never really had BLTs as an omnivore, so I just see this as an interesting way to enjoy tempeh, rather than a way to recreate a favorite meal. There’s not much of a recipe here, since I was starting with pre-marinated tempeh bacon, rather than making my own from plain tempeh. I used Lightlife Smoky Tempeh Strips. They’re pre-cut into thin slices, roughly similar to how bacon is sliced. The “recipe”: Pan fry it in some oil until it seems done to you. I could fit the whole package (enough for two sandwiches) in a large pan at once. Then assemble a sandwich: lightly toasted bread, sliced tomato, lettuce, and vegan mayo (I used Nayonaise). This entry was posted in Recipe and tagged blt, tempeh bacon on September 27, 2013 by Ed Pizzi. So simple it barely qualifies as a recipe, but roasted brussels sprouts are one of my favorite things to make. Preheat oven to 350°F. Cut the ends off the brussels sprouts, and cut them in half, or in thirds if they’re big. Don’t worry about leafy bits coming off; keep them with the chopped sprouts. Put the chipped brussels sprouts in a mixing bowl. Sprinkle in 3 tbsp olive oil and a few pinches of salt. Mix them about until the oil is distributed fairly evenly. Pour the oiled brussels sprouts on a baking sheet (preferably with edges) and spread them as evenly as possible. Roast them in the oven for 30 – 40 minutes total. About halfway through, flip the brussels sprouts over. They’ll have a crispiness to them when they first come out of the oven (almost like kale chips), and they’re best eaten soon afterward. Enjoy! 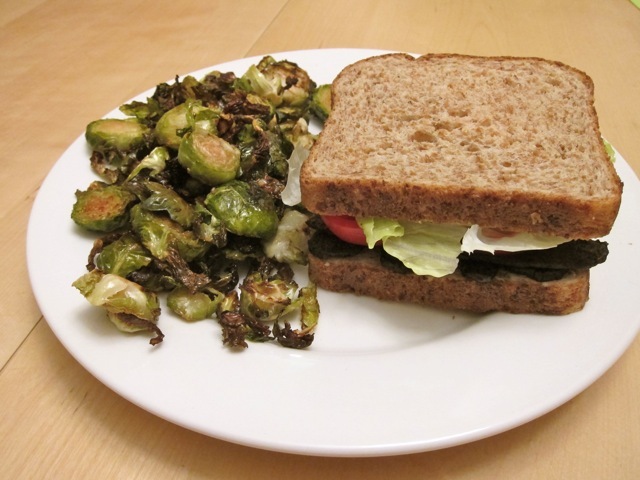 This entry was posted in Recipe and tagged brussels sprouts on September 27, 2013 by Ed Pizzi. Tempeh manis is a somewhat sweet preparation of tempeh (fermented soybeans), and is one of my favorite dishes from a trip to Indonesia a year ago. I’d been looking for a good tempeh manis recipe, until an Indonesian coworker pointed my girlfriend and I at the recipe on The Little Teochew. Fry 16oz of tempeh, and set it aside. I pan fry, rather than submerging the tempeh in oil. Then pan fry a few shallots sliced thinly, garlic, and a sliced red chili in oil. I didn’t have shallots this time, so I used half an onion. I also seeded the chili. It wasn’t spicy at all, so maybe unseeded would be fine. Add 1/2 cup water and 1.5 tbsp sugar to the pan, and cook until it starts to caramelize. The amount of water doesn’t really matter, since it’ll cook off until the right amount of water is left. I tried to dissolve the sugar in the water before adding it. Add the tempeh back in, and drizzle 1 tbsp kecap manis (see below) evenly throughout. You’ll want to add the tempeh before the sauce gets too thick, otherwise it won’t spread onto the tempeh very evenly. If it’s too thick, just add some water, and try again. 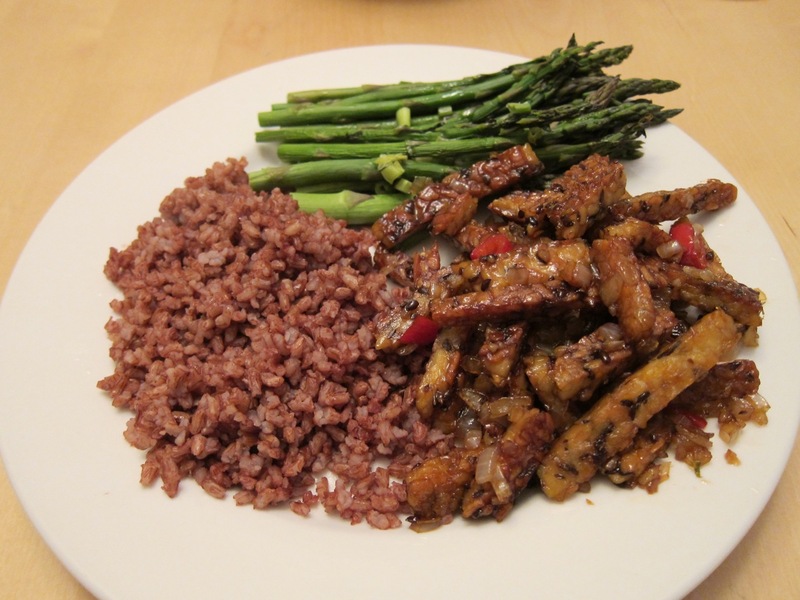 Tempeh manis, with red rice and roasted asparagus. 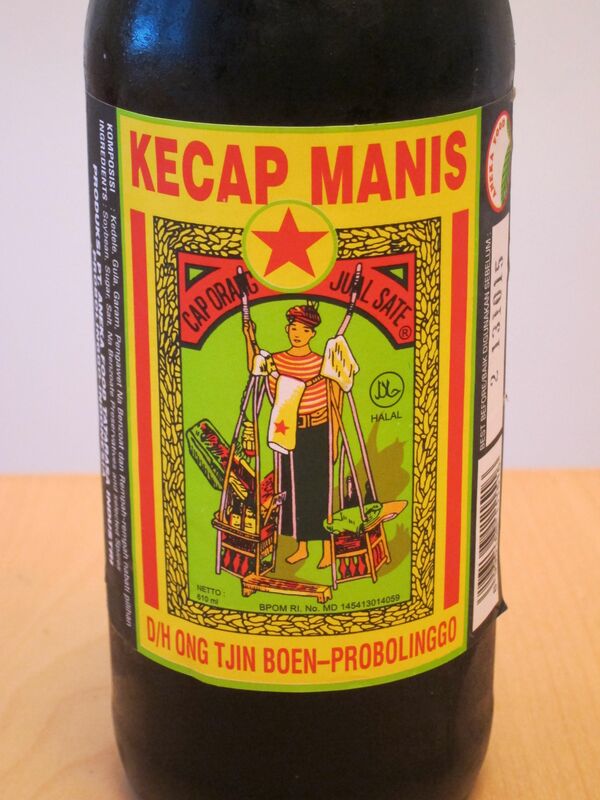 There was one hard to find ingredient in there: kecap manis (alternatively, “kicap manis”, or “Indonesian Sweet Soy Sauce”). The nearest Asian grocery store to me, Duc Loi in SF’s Mission district, didn’t have it, despite an aisle of sauces from various Asian cuisines. 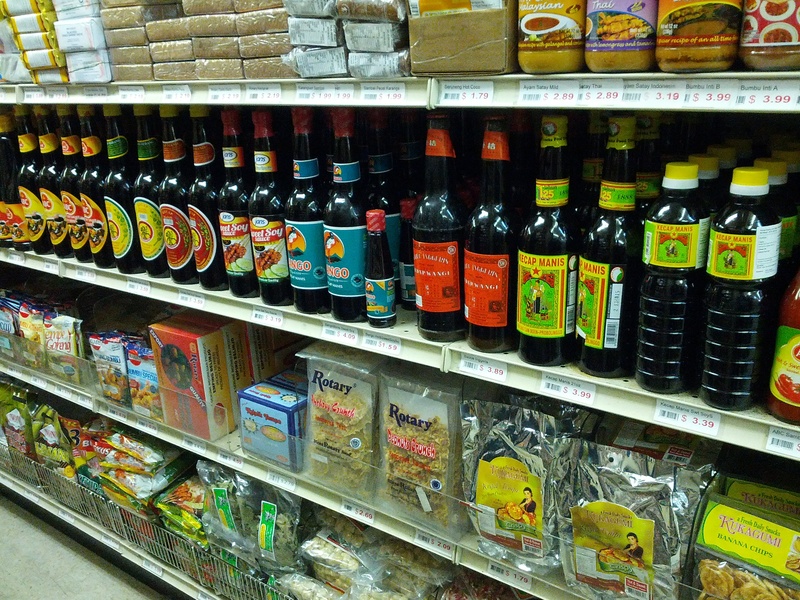 I tried a few places in the Richmond, until striking gold at New May Wah, which has a large Indonesian section, including an entire row of kecap manis sauces. The turning point: every bottle pictured is kecap manis. I’m not entirely clear on what this stuff is. The ingredients are listed as: “Soybean, sugar, salt, NA benzoate preservatives and selected spices”. I’d describe the taste as being similar to molasses with a hint of soy sauce. It’s pretty tasty though, and gives the tempeh a nice color. I’m also told that some people see the use of kecap manis as cheating, so assumedly there is a longhand version of this recipe that produces something similar without using kecap manis. For now I’m pretty content to stick with this version. This dish is on the sweet side for a main, and is often served as an appetizer in Indonesia. We use it as a protein from time to time, but if you’re sensitive to sweet foods you may want to go easy on the sugar, or have smaller portions as a snack. Update: The Great Dorset Vegetable Experiment has a recipe for making Kicap Manis! Fascinating. If we continue to make this, we’ll have to try that sometime. Although for the time being I have a ton of the store-bought stuff. This entry was posted in Recipe and tagged Indonesian, Kecap manis, Tempeh, Tempeh manis on June 19, 2013 by Ed Pizzi. The idea behind Artisan Vegan Cheese is to ferment various vegan foods, in a similar way to how milk products are fermented to produce cheese. This builds on cultured cashew cheese, which is popular in the raw food community, made by culturing pureed cashews with a probiotic. Making rejuvelac is really easy. 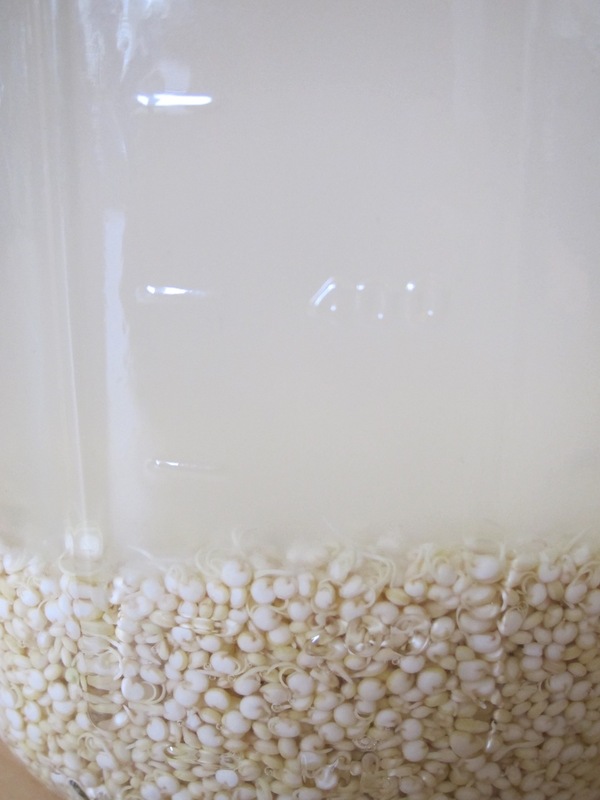 You sprout a grain, add water, wait a few days while it ferments, and strain the grain away. 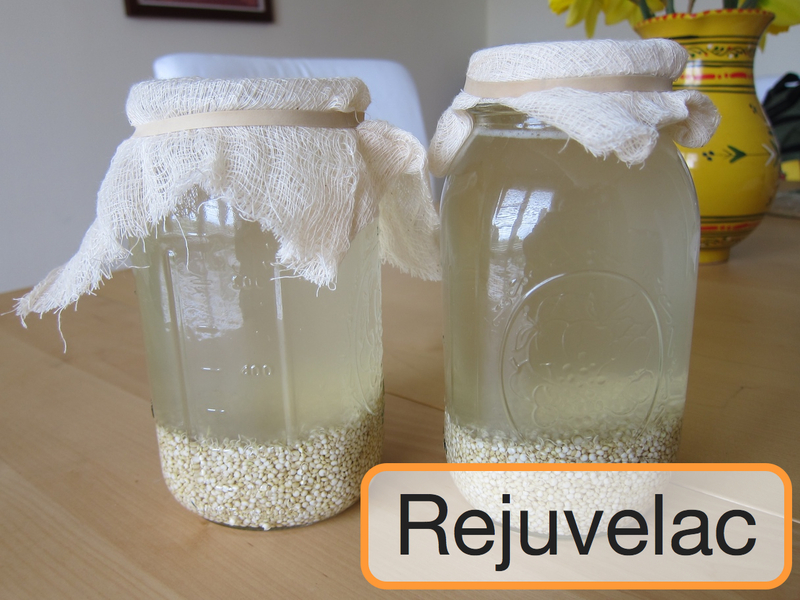 I’ve only made rejuvelac from quinoa, which is said to be the easiest grain to sprout. The grain must be a whole grain capable of sprouting, so avoid grains that are already sprouted. Many people have trouble with grains like rice, which are often irradiated, which prevents sprouting. 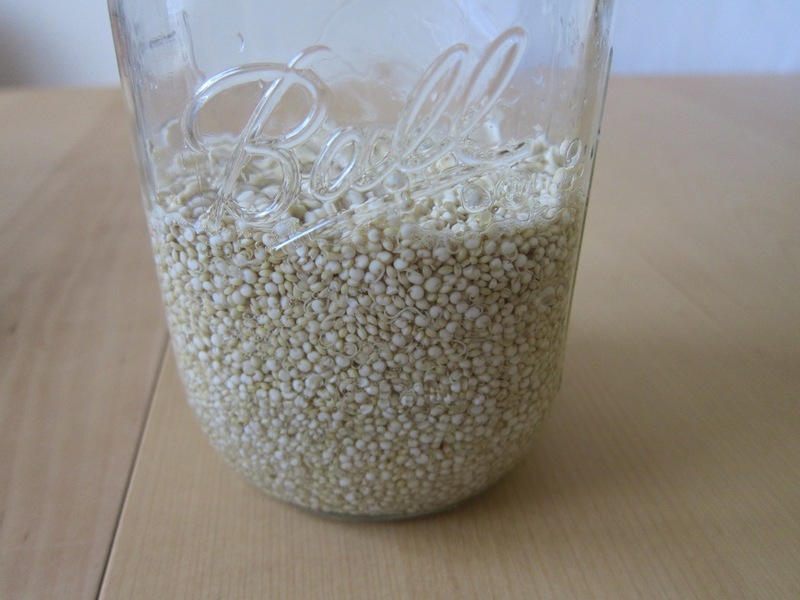 First, rinse and drain the quinoa, then soak it for 8 to 12 hours in plenty of water. Then remove most of the water, leaving the quinoa moist, but not covered in water. Some recipes call for leaving the grains nearly dry. Cover the jars with something breathable, such as cheesecloth secured with rubber bands. 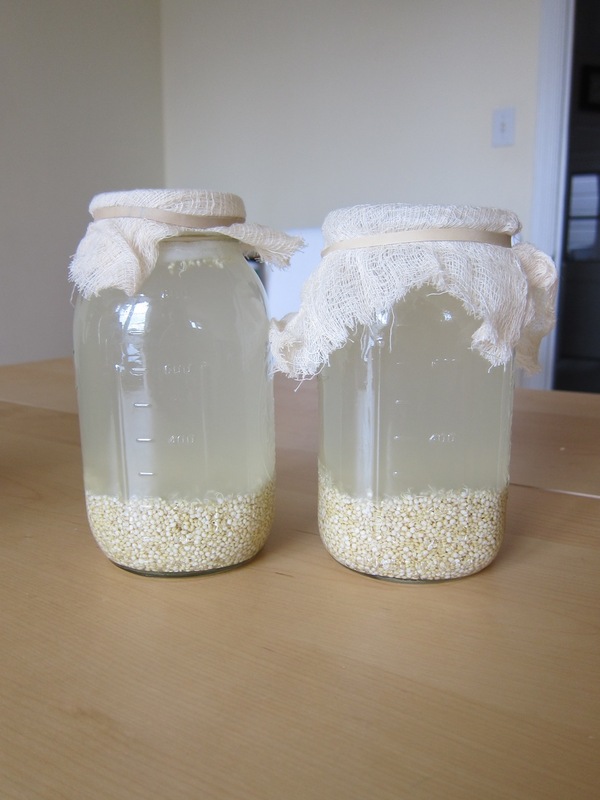 A few times a day (for me, typically once in the morning and once in the evening), rinse the quinoa with water, then drain them. Do this until they sprout. In some cases this takes a few days, sometimes just 12 hours. Note that quinoa has a ring shaped germ that starts to separate almost immediately once the quinoa is soaked. Don’t mistake these for sprouts! Feel free to sprout the quinoa for another day or two if you’re not sure if it has really sprouted. 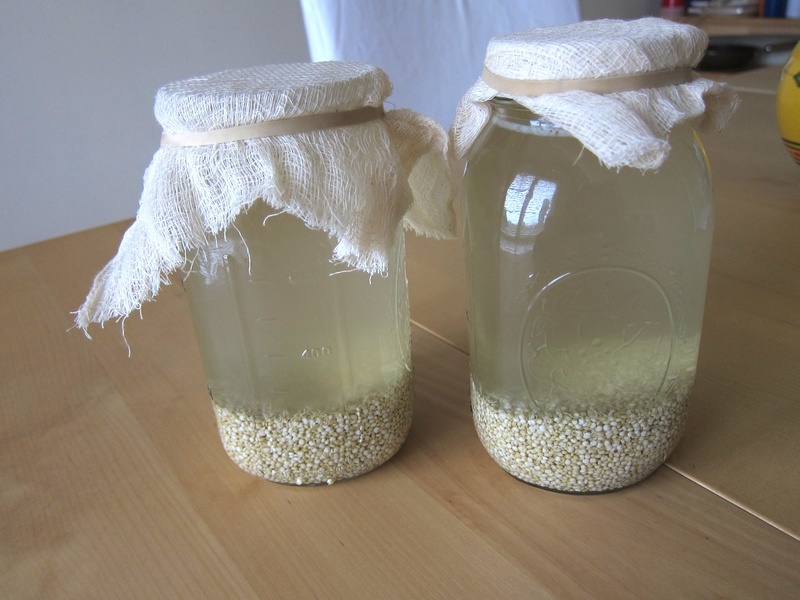 Once you have sprouted quinoa, soak it in water, and leave it to ferment. Leave the soaked sprouts at room temperature for a day or so (I’ve left it for a few days), somewhere without too much sunlight. I use the top of my fridge, since heat from the compressor makes that a warm spot, and the apartment is otherwise pretty cool. When the rejuvelac is ready, the water will be cloudy and slightly carbonated, and it will have a pleasant smell. It’s usually described as having a slight lemony taste. Strain away the quinoa, and the liquid is your rejuvelac! Use it as a probiotic drink, or to make cashew cheese, or other fermented food! People who are advised to avoid unpasteurized cheese due to bacterial infection concerns (eg. pregnant women, infants) should probably also avoid fermented foods like rejuvelac and unpasteurized vegan cheese, for the same reason. If in doubt, ask your doctor. On forums discussing rejuvelac, a common question is “should the rejuvelac smell like stinky feet / rotten balls / death covered in poop?” The answer is: no! If this happens, you’ve certainly cultured something, but probably not the targeted “good” bacteria. The potential health consequences of consuming it are unknown. Rejuvelac takes very little work (even if it takes time and patience), so just try again with another batch. 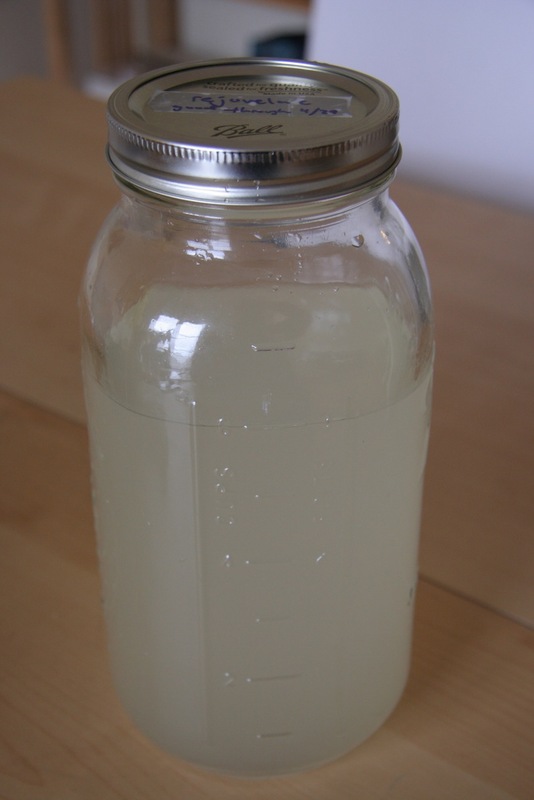 Be sure to use clean dishes for fermentation, and if you have persistent problems, try using purified or filtered water. 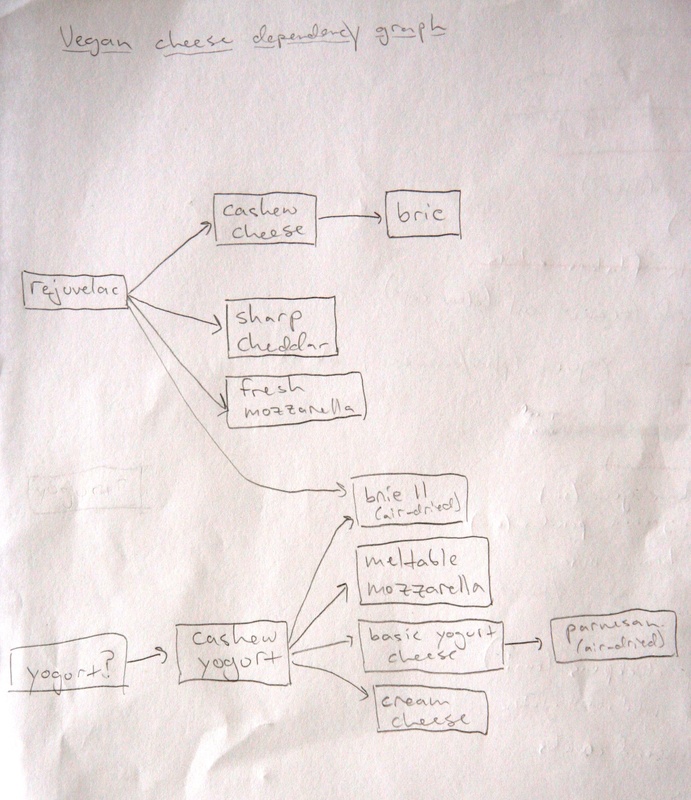 This entry was posted in Recipe and tagged Artisan Vegan Cheese, Fermentation, Rejuvelac on May 23, 2013 by Ed Pizzi. “Sparkled ginger cookies” from Vegan with a Vengeance (by Isa Chandra Moskowitz of Post Punk Kitchen fame) is my favorite cookie recipe so far. It doesn’t require any special ingredients, so we can pretty much make it whenever. I’m hoping that we’ll be able to make it when traveling to visit family. You can find the recipe online in this blog post. I’ve made this recipe twice — once as written, and once with additional liquid, resulting in a softer cookie (2/3 cup canola oil, 1/3 cup molasses, 1/3 cup soy milk). Both were delicious, although the latter was substantially messier dough to handle. I recommend baking the recipe in two batches, on two cookie sheets. The first time around, I tried to be a hero and bake them all on one sheet, and sort of wound up with one giant cookie. It was still tasty! Since this recipe is by a PPK host, I’ll end by mentioning the Post Punk Kitchen Forum. This is a great resource for sharing tips and asking questions related to vegan food, or just learning what is out there — restaurants, cookbooks, supermarket products, etc. 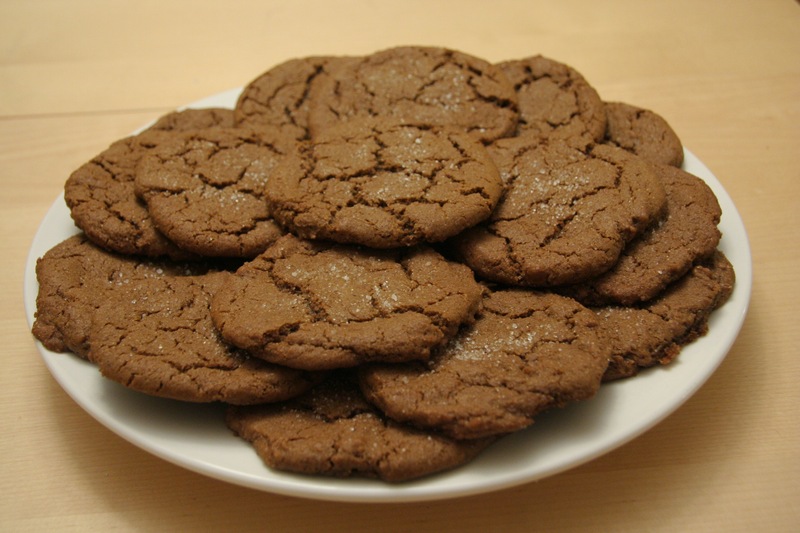 This entry was posted in Recipe and tagged cookies, ginger, vegan with a vengeance on May 14, 2013 by Ed Pizzi.